The photographer took his camera inside one of the most popular floor plans in the Gulf Stream Coach lineup, the Conquest Class C 6238, and the results are posted online here. 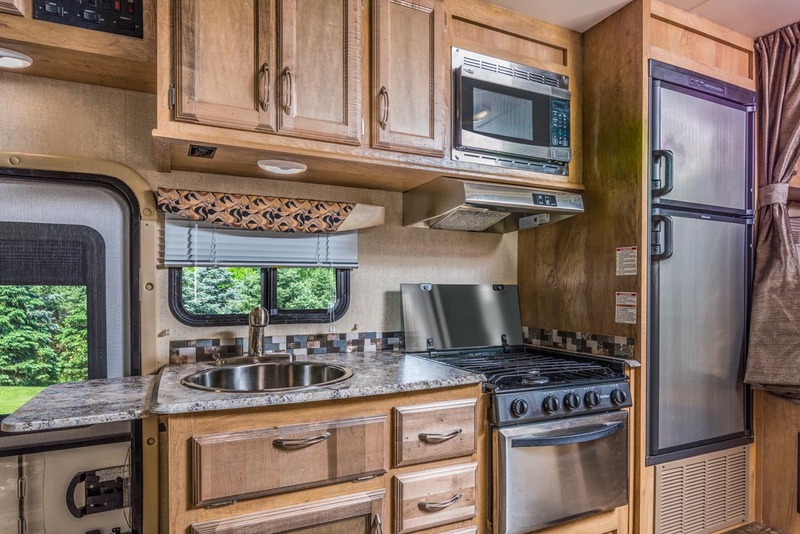 The 6238 provides motor home customers with every comfort of home, in a well-planned and skillfully built floor plan. 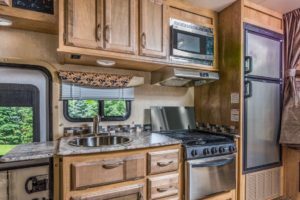 The 6238 includes a large 60″ x 74″ bed, a full dry bath, a large main living area with a convertible dinette in the slide-out, and a full stainless steel kitchen. We build the 6238 on the rugged, efficient, powerful Ford E350 platform, with the Ford 6.7L V10 engine. But Gulf Stream Coach takes over just one inch above the steel rails of the Ford chassis, where we add our exclusive “Cradle Of Strength®”. 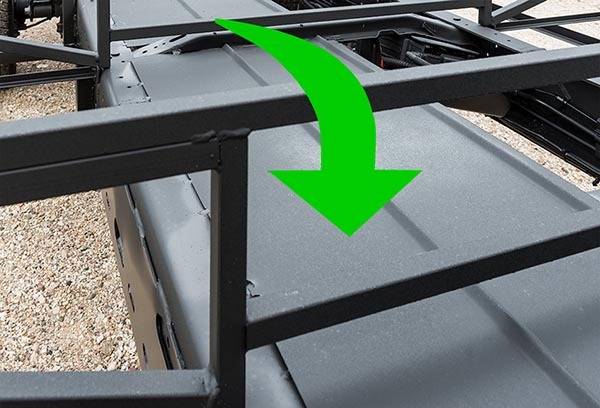 The Cradle Of Strength® (see our previous post) uses box-style steel trusses, steel stringers, welded braces, metal cargo boxes, and a diamond plate subfloor to help keep your traveling family safe and comfortable. The 6238 is enclosed by lightweight yet rigid laminated fiberglass walls that use welded tubular aluminum, rigid polyfoam insulation, and synthetic Azdel subtrates. We vacuum-bond these layers with advanced adhesives in our own lamination plant, using a proprietary process we’ve developed over the past 30 years. We build the roof with a welded aluminum truss system and seamless synthetic rubber to shed water and resist leaks. 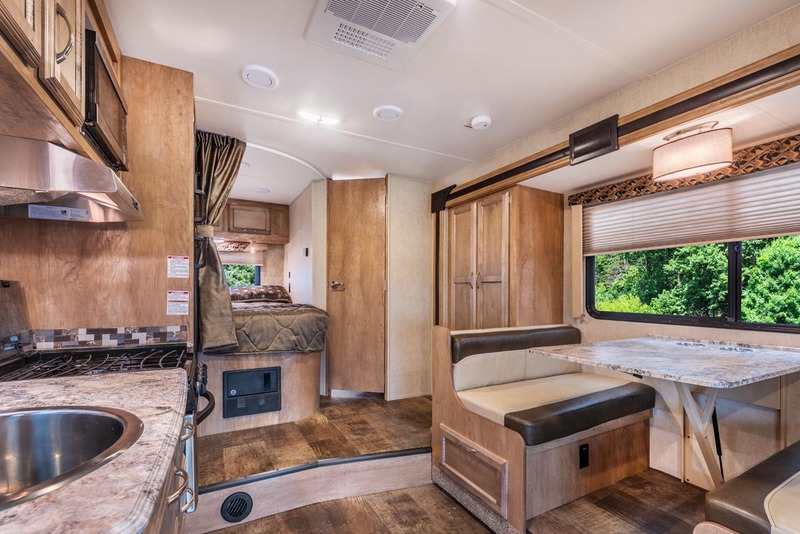 The decor and furnishings inside the Conquest Class C 6238 reflect the casual yet sophisticated look popular in vacation homes, with extensive use of our Roanoke Light Cherry woodwork and coordinating fabrics, leather-touch vinyl, and easy-care wood-grain flooring. Electronics include hookups for an optional HDTV/DVD player, a standard rear-mount backup camera and in-dash color monitor, USB charging ports, and cool, efficient LED lighting inside and out. Drawers, cabinets, closets, and other storage areas are handy at every turn. Floor-ducted heating and overhead ducted air conditioning keep your family comfortable, and a standard 4-kilowatt generator keeps everything powered up. Explore the gallery and see the 6238 for yourself. Better yet, use our Dealer Locator to find the Conquest Class C line at a Gulf Stream Coach dealership near you. Click here to get email notice every time we add a new post. You’ll be the first to know about new products, features, technology, and events from Gulf Stream Coach. 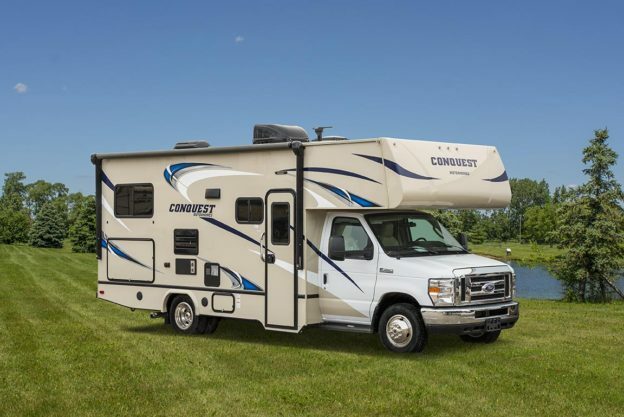 This entry was posted in News, Product Update and tagged Conquest 6238, Conquest Class C, Conquest Motor Home, Image Gallery on April 5, 2017 by pcampbell@gulfstreamcoach.com. We’ve spent over thirty years building motor homes that give you the same kind of comfort, convenience, and safety you enjoy in your own home. So far we’ve put over 60,000 motor homes on the road – and, as you can imagine – we’re really good at it! Imagine this too: Imagine what it’s like to build a home that has to travel 70 miles per hour on an Interstate Highway, and wind its way along narrow, bumpy country roads. Then imagine a home that has to go up and down hills, brave the rain, snow, and searing summer sun, all while carrying the people you love most from one place to another. Because you put your family in our hands, we put a “Cradle Of Strength®” under your motor home. Unique in the RV industry, the Gulf Stream Coach “Cradle Of Strength®” is the carefully engineered foundation of steel we add to the motor home chassis. 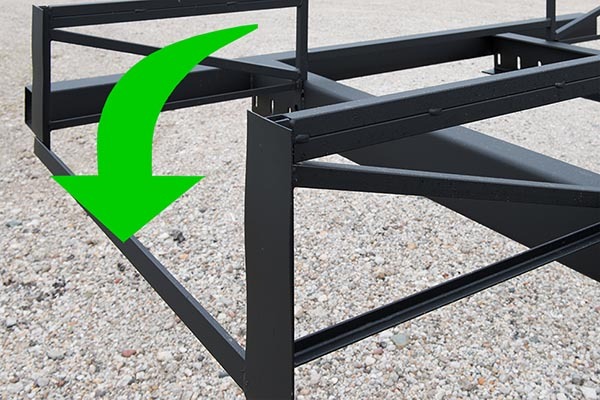 Our Cradle Of Strength® uses large box-style TUFF TRUSSES rated at 6,000 lbs. each. That puts more welded steel across the chassis rail than the triangle trusses other manufacturers use. We further stiffen and strengthen the trusses with front-to-rear steel stringers. We build our outside storage compartments with galvanized steel, not plastic, then wrap the insides with felt to protect your cargo. We use extra welds and brackets to mount our TUFF TRUSSES on top of the main frame rail so they can’t shift down. 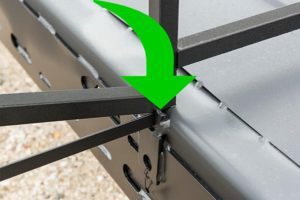 Finally, we cover the drivetrain and service lines with a 26-gauge galvanized steel sub-floor. Our Cradle Of Strength is the perfect foundation for our laminated floor and walls, providing incredible stiffness, resilience, and durability. That strength translates into more dependable road manners, easier handling, and an overall safer, less-stressful driving experience. We give you a “Cradle Of Strength®” – and no one else does. If you want a “Cradle Of Strength®” as the foundation of your family’s next RV, there’s only one way to get it: Choose a Gulf Stream Coach motor home. 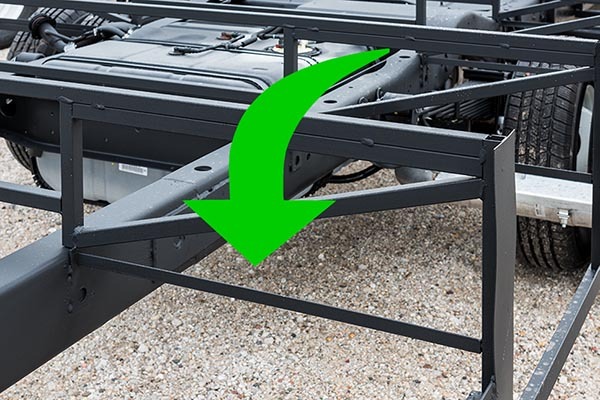 Whether you prefer the family-favorite Conquest Class C, or “The sports car of motor homes” BT Cruiser, you can rest assured: There’s a “Cradle Of Strength®” supporting and protecting you everywhere you go. This entry was posted in News, Product Update and tagged BT Cruiser, BTouring Cruiser, Conquest Class C, Conquest Motor Home, Construction, Cradle Of Strength, Gulf Stream Coach on March 21, 2017 by pcampbell@gulfstreamcoach.com.